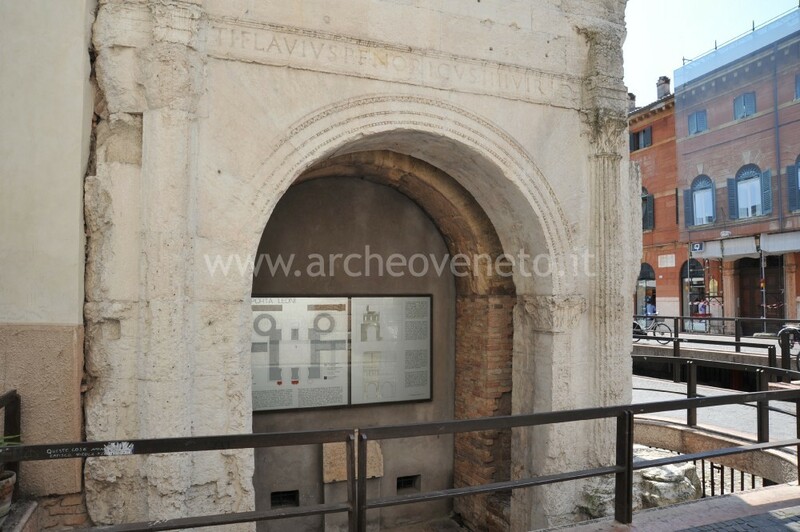 The gate “Porta Leoni” was one of the main accesses to Roman Verona, at the southern end of “kardo maximus”. It was built in the I century B.C. and renovated in the I century A.D. 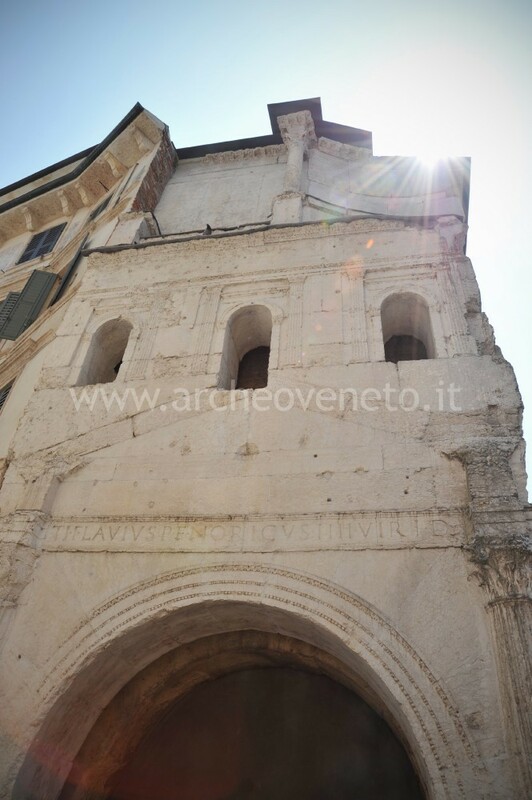 The remains of the gate “Porta Leoni” have always been partially visible, but for some parts they were brought to light thanks to the restoration works in 1958-1959. 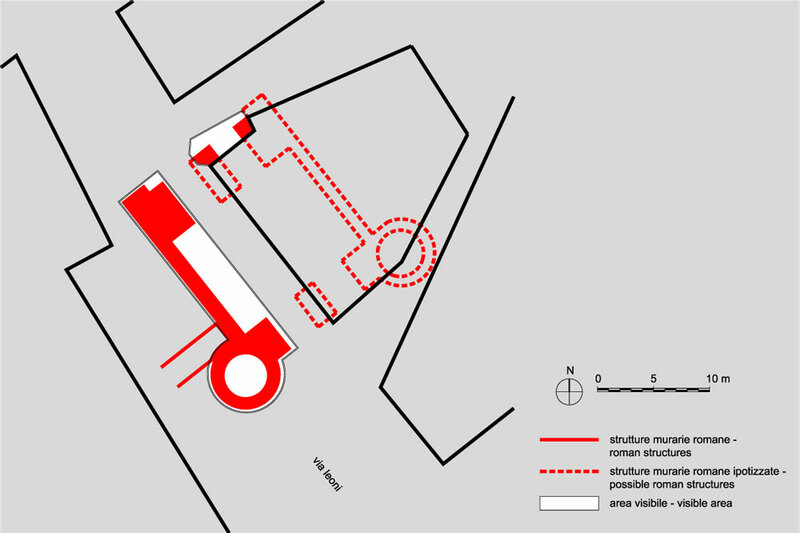 The excavation of the gate (one of the first urban excavations in the city) and its monumentalization in the middle of the street “via Leoni” were carried out between 1974 and 1981. These researches allowed to understand the plan and the elevation of this structure. Verona is located along the Adige river, where this enters in the Po plain, at about thirty kilometres east to the Garda lake. Its altitude is 59 metres above sea level and it is placed at the basis of the Lessini mountains. The gate “Porta Leoni” is located along the south-eastern side of the city walls, where they were crossed by an important extra-urban road. I century B.C. (mid) – I century A.D. 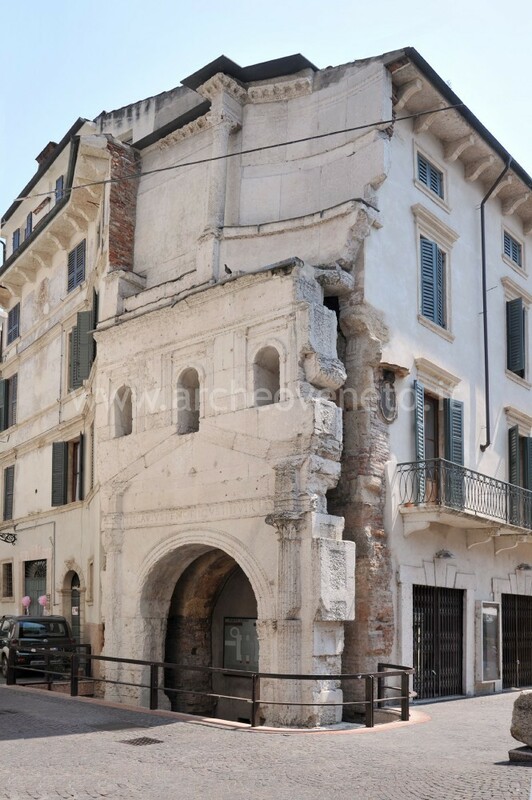 The two main Roman city gates of Verona, “Porta Borsari” and “Porta Leoni” opened in the two walls that defended two sides of the city – the other two sides being naturally defended by the Adige river. “Porta Leoni” was called so after the lid of a stone sarcophagus with two lions. The sarcophagus used to be near the gate while today it is behind the close monument of Umberto I. The remains of the gate “Porta Leoni” today include parts of its eastern side, which are incorporated in the external walls of a building, and parts of its western one, which is displayed in the archaeological area below road level. 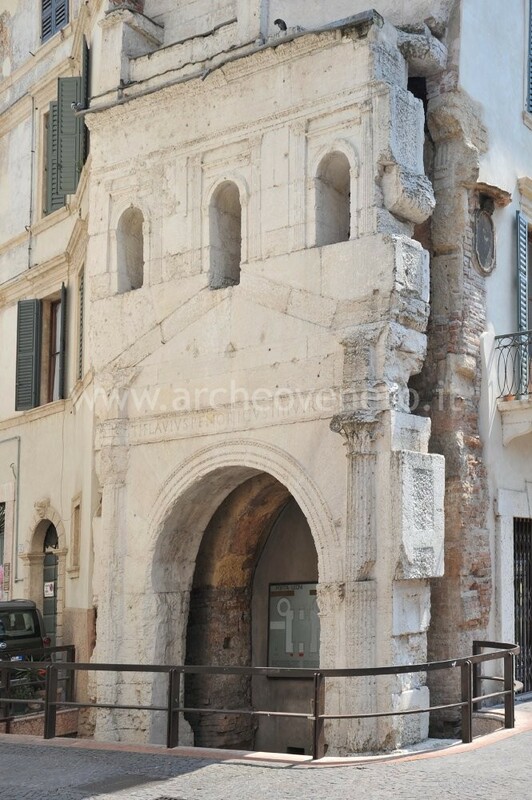 The gate “Porta Leoni” was built between the I century B.C. and the I century A.D. and was the main city entrance at the end of one of the main urban road. It was 13 metres high and it had a squared plan (about 17 metres per side) with rectangular inner court. It also had a double front with arches about 3,3 metres high and galleries at the upper levels. The front towards the countryside had two polygonal towers, the foundations of one of which are visible in the archaeological area. The remains also include part of the front towards the city, with one arch only and three window-openings at the first level. 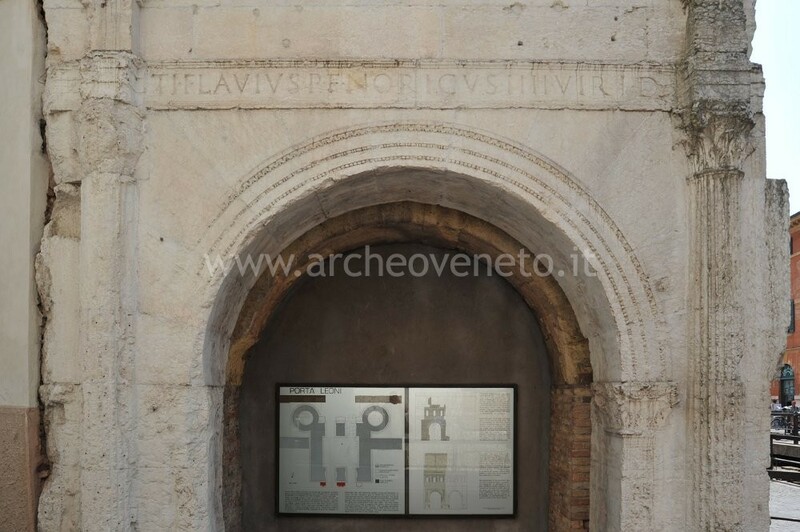 This front also displays the inscription that reminds the door having been constructed at the same time as the city walls, the sewerage system and the roads. In mid I century A.D. these two brick fronts were embellished through white stone façades. These façades followed the design of the previous fronts but they were higher and richly decorated, as per the fashion at those times. The remains include part of the façade towards the city with a niched arch, three out of six openings on the first floor, half of the big top exedra (which was probably decorated with statues) and one of the moulded panels that framed the exedra together with Solomonic columns. These façades were renovated by a college of magistrates, and one them is referred to in the inscription on the architrave. Beschi L. 1960, Verona romana. I monumenti, in Verona e il suo territorio, I, Verona, pp. 369-552. Forlati Tamaro B. 1965, Verona. Il restauro della Porta detta dei Leoni, in Notizie degli Scavi, s. VIII, 19, suppl., pp. 12-34. Mangani E., Rebecchi F., Strazzulla M.J. 1981, Emilia, Venezie (Guide Archeologiche Laterza), Bari, pp. 171-172. Cavalieri Manasse G. 1986, Porta Leoni: appunti per la ricostruzione di un monumento, in Scritti in ricordo di Graziella Massari Gaballo e di Umberto Tocchetti Pollini, Milano, pp. 159-172. Cavalieri Manasse G. 1987, Verona, in Il Veneto nell’età romana, II, a cura di Cavalieri Manasse G., Verona, pp. 7-11. Cavalieri Manasse G. 1993, Le mura di Verona, in Mura delle città romane in Lombardia, Atti del Convegno (Como 1990), Como, pp. 179-215. 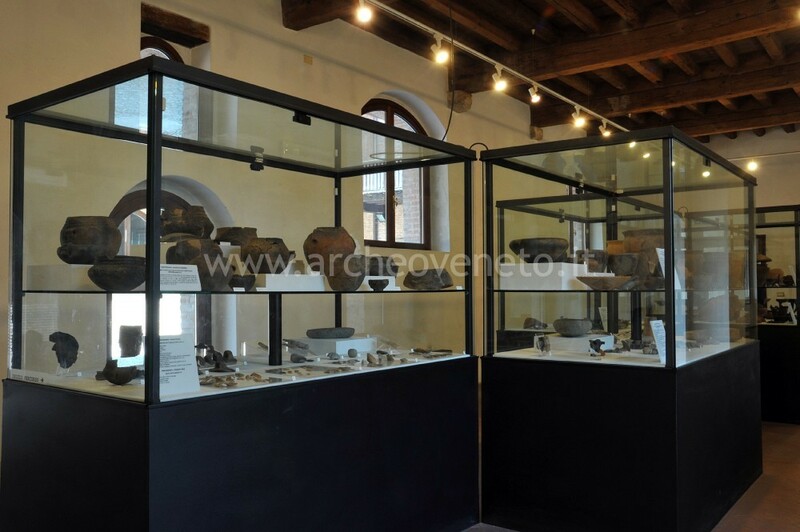 Archeologia a Verona 2000, a cura di Bolla M., Milano, pp. 37-39. I luoghi della cultura 2006, Roma. Bonetto J. 2009, Veneto (Archeologia delle Regioni d’Italia), Roma, pp. 447.